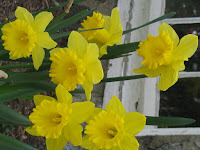 Healthy Loser Gal: March Challenge: Think Spring! March is FINALLY here! At times in Boston this winter, I wondered if we'd make it to March... Snowmagedon was upon us all season it seemed! But... the days are longer, the sun is brighter again and spring is, indeed, right around the corner - only TWENTY DAYS to go! Woohoooo! So let's get a little SPRING in our steps, shall we, friends? This month's challenge is all about finding your personal groove in fitness and weightloss (if you're trying to lose weight). There are 31 days in the month and bathing suit season is not too far off. Let's commit to concentrating on fitness for 24 of the 31 days. That gives you 7 days of freedom to do nothing at all or unplanned activities. Get out your calendar or open up your electronic calendar and commit to yourself which of the 24 days of March you're going to exercise for at least 30 minutes by marking it in your calendar. I, personally, plan to get a lot of walking in so I'm concentrating on step aerobics and walking this month to boost my lungs and get ready for the spring. April will be my "core" month! There is one other - very easy - part to this #hlgSpring challenge: grab a piece of paper or poster board or construction paper and write down one goal you'd like to accomplish this Spring. Don't let negativity creep into your mind as you write it down, don't think "I'd really like to lose 10 lbs but I know I'll never do it"... Instead write down "I'm going to lose 10 lbs by June 20th!" Now, if that were me, I'd write down "I'm losing 10 lbs. by June 20th! WOooHoooo! I ROCK!" *grin* And then I usually find photos to reinforce my goals from magazines and cut those out, too, paste 'em to the Goal Poster and have a mini "dream board". Whatever you do this month, remember to Think Positive when you're Thinking Spring. 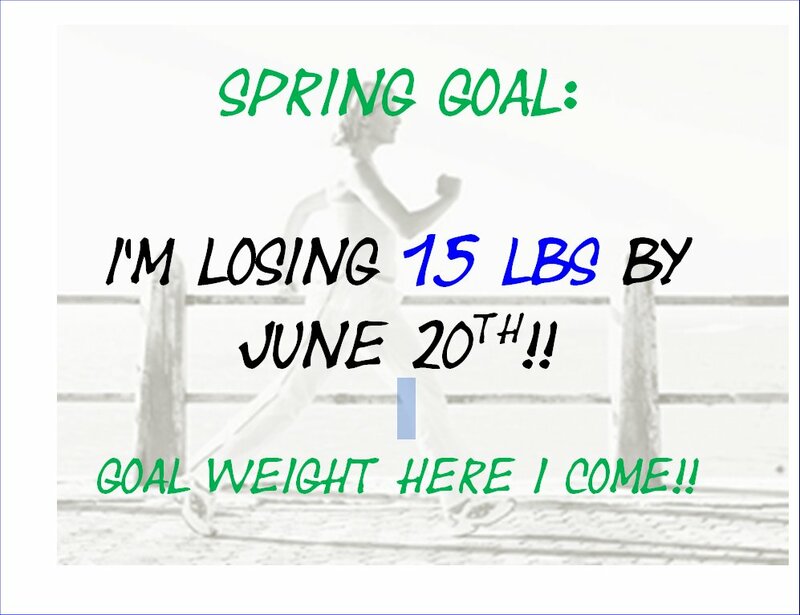 Set a Spring Goal and stick to it. Let's start Spring off with a spring in our step... a goal in our mind... and the joy of being true to ourselves in our heart! We are SO worth the effort, friends! I am in! Goal to be posted shortly! Thanks for the encouragement. I shall push on! You're looking grat. Love the t-shirt. I just wrote my post with my March goals too! Here's to March! Cheers! I'm totally in. I blogged about some of my goals already today and just got home from walking my first mile - at one time - in at least six months. I like your idea of March being a walking month and April being a core month. And thanks to you, my calendar is made out and I'm looking forward to the 31 days of March! Enjoy your walking! Lovely I am in! 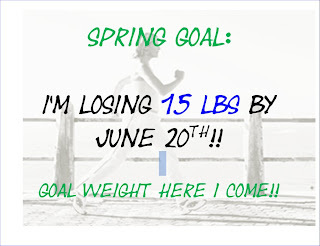 Feb 7th I joined weightwatchers and 8lbs I am well on my way for my 30lbs weigth loss goal by Memorial Day! Deb, great to reconnect, my friend! Kristin - I'm gonna pop over to blogtalk and see if I've missed any of your shows!